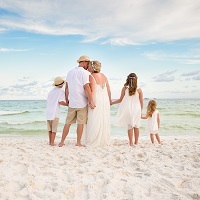 With over 300 Feet of Private Pristine White Sand Beach and Emerald Waters, The Venue at Royal Palm Grille provides the ideal location for your Dream Beach Wedding or Special Event. Come stay with us in our luxury Condo Suites. Dance the Night away in full view of the Gulf of Mexico from our Event Room or enjoy the Fresh Air overlooking the beach for a cocktail hour on our Sun Deck. Throw an after party at our Beach Bar that stays open until 2am or host a Bonfire Luau Rehearsal Dinner on our Private Beach. All this and be pampered in our onsite Spa and Salon and enjoy dinner at our onsite Award Winning Restaurant. No other location on the Emerald Coast can match our service or our views! Reservations are made on a first come first serve basis. Management reserves the right to refuse any function at their discretion. A reservation is complete only upon the execution by all parties of this agreement and receipt of payment for the reservation deposit. The Non-refundable reservation deposit/retainer is equal to 50% the rental fee. Payment in full is due within thirty days (30) of the event and is Non-refundable. For use of our Private Beach, for ceremonies only, the rental fee is waived with the rental of The Event Room OR there is a permit fee of $350. This fee includes use of the Beach only. Ceremony Equipment and other services are available for an additional fee and must be selected separately. Food and Beverage at our Venue is provided by Royal Palm Grille. Your Event Coordinator will assist you in the details of your Food and Beverage Menu Selections. No offsite Food or Beverage Catering is permitted. Very Important: Management must approve any Décor or Equipment provided by the Client or outside Vendor. A full list of any outside items you wish to provide must be sent in writing to your Coordinator for approval.. All Decor provided by Clients or outside Vendors must be set up and broken down by the Client or outside Vendor. Island Sands Beach Weddings and Royal Palm Grille Staff will not be responsible for setting up or breaking down these items unless special arrangements have been made. Please discuss your plans with your Wedding Coordinator well in advance to ensure your event runs smooth. Failure to do so may result in not being allowed to use the items you bring with you. Special arrangements must be made to schedule and gain access to the Beach for set up. Any function will be terminated immediately upon the discovery of any outside Alcohol or Illegal substance (i.e. illicit drugs) brought to the premises by a client or any guest of a client. No persons under 21 years of age shall be allowed to consume alcoholic beverages. Island Sands Beach Weddings and Royal Palm Grille is not responsible for items of personal property left by a client or guest. Management does not require a security deposit to cover damages. The client understands and agrees to pay for any missing items or damage incurred to any structure, furniture, fixtures, or equipment if the client or any guest of the client caused the damage and must pay the replacement value of item/s within 10 days. There is currently no wheelchair ramp access to the Beach. Special arrangements may be made by contacting Walton County Sheriff Department to transport guests in a Wheelchair onto the Beach. © 2016 Copyright. All Rights Reserved. Site Designed By: Cyber Sytes, Inc.